Here's a very cool song that was sent our way from Chicago-based songwriter Dave Wechsler of Piñataland, a Brooklyn-formed, historically-themed rock unit. The single - to be included on the upcoming album from Wechsler's new project The Tyranny of Dave - is called "The Greatest Generation," and is described by the songwriter as "an homage to both Talking Heads' 'Naive Melody' and the World Trade Center." The "Naive Melody" influence is definitely present, but instead of sounding simply like a retread the song is fresh and thoughtful with hooks that grab straightaway. 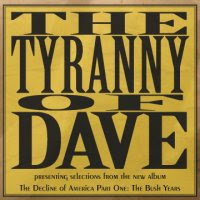 Download mp3: The Tyranny of Dave - "The Greatest Generation"
The album is called The Decline of America Part One: The Bush Years, and Wechsler says it deals with the political failures of 2001-2008 as well as his personal ones during that time period. The CD release party is scheduled for Saturday, January 2 at Uncommon Ground on Devon (1401 W Devon) at 10 p.m.